The Realistic LAB-420 precision direct drive turntable is designed to meet the high standards of performance that audiophiles expect for superior sound reproduction of their disc recordings. The turntable employs a powerful brushless DC servo motor for unwavering, near-perfect speed. The stroboscope with bright neon lamp makes speed adjustment precise and very easy. The S-shaped tone arm keeps the stylus of the cartridge perpendicular to the radius of the groove over the full surface of the record, which means low distortion and excellent tracking at less than 1.5 grams. 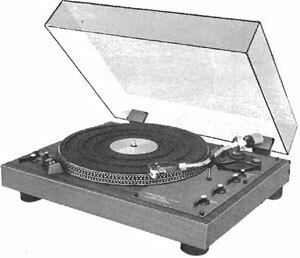 The turntable comes complete with Moving Magnet type cartridge with 0.7 mil diamond stylus that reproduces frequencies between 20-20,000 Hz while maintaining superior channel separation. Realistic LAB-420 / LAB 420 owners manual, service manuals and schematics are for reference only and the Vinyl Engine bears no responsibility for errors or other inaccuracies. The PDF files are provided under strict licence. Reproduction without prior permission or for financial gain is strictly prohibited. This website is not affiliated with or sponsored by Realistic.